For many, Sir Laurence Olivier is the greatest performer of any generation. Without any hint of exaggeration, he was a legendary actor and director and it is fitting that British Theatre’s most illustrious awards proudly bear his name. His 60-year career exhilarated audiences around the world earning him multiple Academy Award nominations and wins, plus honours never before given to other actors. 1907 – Sir Laurence Olivier was born in Dorking to a strict clergyman who initially pushed Laurence into the church but soon realised the stage was a better place for him. 1924 – He was awarded a bursary to attend the Central School of Speech Training and Dramatic Arts. 1930 – After leaving school, he ventured to the West End receiving his first taste of stage success in Noel Coward’s Private Lives. 1935 – Following his initial West End success, Olivier starred in what is still considered to be the greatest Shakespearean production ever, Romeo & Juliet where he shared the roles of Romeo and Merchutio with John Gielgud. 1939 – Olivier made his first foray into Hollywood and received international renown for roles such as Heathcliff in Wuthering Heights. 1940 – Olivier married Vivien Leigh who had just gained world fame for playing Scarlett O’Hara in Gone With The Wind making her one of the most desirable women in the world. The union resulted in Olivier’s fame rising further. 1941-1956 – Moving his focus to filmmaking, Olivier was nominated for multiple Oscars. He made film history for winning the Best Picture award and the Best Actor award for Hamlet in 1949. Other nominations for Best Actor included The Boys From Brazil, Marathon Man, Sleuth and Henry V. He also received two honourary Academy Awards, too. 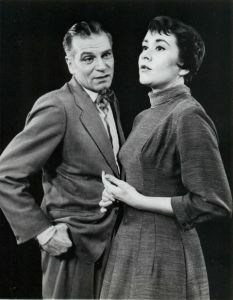 1957 – Olivier’s most notable post-war performances came in 1957 when he appeared in Jon Osborne’s The Entertainer, thus aligning himself with the new wave of British Theatre. 1963 – At this point, Olivier was fast becoming known for his direction and took the helm of the newly formed National Theatre Company at the Old Vic. 1970 – Always the trailblazer, he became the first actor to be made a Lord. 1979 – Sir Laurence Olivier was awarded a special Society of West End Theatre Award – now known as an Olivier Award – for his contribution to theatre. 1984 – The legendary actor and director gave Society of London Theatre (SOLT) permission to call their awards the Olivier Awards. 1989 – At 82 years old, Sir Laurence Olivier passed away. Up until his death, he insisted he was just ‘Larry’, but London theatre will always remember him as a man who will forever be the benchmark for theatrical talent.